Look, we’ll just come out and say it, as long as you don’t mind the isolation, if this fits your budget, Phi Phi Relax Beach Resort is the best place on Ko Phi Phi. Ad Book now! Rates from US$27.8++. Average rating 7.9 from 2,312 reviews. The bungalows are beautiful and designed with love. The staff are great, providing the right combination of leaving you be and being attentive. The isolation may make some feel out of touch, but for others it will be heaven on earth. 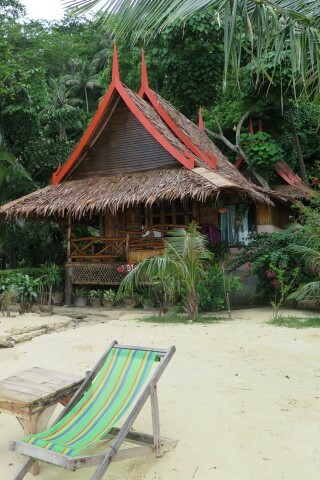 Relax Beach Resort has well-designed and well-maintained bungalows in a very pretty setting along the beach. They don’t exactly charge backpacker prices, but this is a great little place to stay if you’re looking for an out-of-the-way bungalow experience with a bit more polish and comfort. All the bungalows are immaculately clean and sturdy, with hardwood floors and good attention to detail -- each with a very decent attached private bathroom. Cute little day beds are attached to the front of the hut, great for lounging in the breeze during the hot day. The bar/restaurant has a very pleasant character, with a raised platform full of mats and cushions for chilling. While all the rooms have a fan, bear in mind that the electricity only gets switched on at 18:00. If you occupy yourself at the bar past the witching hour, they mercifully keep it running for a couple hours after people go to bed. Gadget addicts, however, are well served with free WiFi available all day on battery-powered routers. Highly recommended. Reservations in high season are essential.